Due to the specificities of its work, the ICRC can at times be the only humanitarian actor to have access to areas and people affected by armed conflict and other situations of violence. As a result, the information that the ICRC collects as part of its activities—which may include information on alleged violations of the law—is sometimes requested in the context of legal proceedings. By its very mandate, the ICRC encourages efforts to ensure accountability for international crimes. However, alongside this, the ICRC’s own distinct, yet complementary, role of ensuring respect for the law through bilateral and confidential dialogue needs to be preserved for the benefit of affected populations. This blog post offers five reasons why ICRC information should (and must) not be disclosed or used in legal proceedings. It focuses on the ICRC’s protection activities and discusses the example of ICRC confidential reports to authorities as one of the ICRC’s most traditional types of interventions. The same considerations apply, however, mutatis mutandis to all other confidential communications and ICRC confidential information in general. The ICRC is as a neutral, independent and impartial humanitarian organization mandated, above all, to protect people affected by armed conflicts and other situations of violence and provide them with assistance. As such, it carries out a wide range of activities. These include visiting places of detention in order to make sure that all people deprived of their liberty (whether civilians or members of armed forces or groups) are treated humanely and with respect for their dignity and benefit from adequate conditions of detention. The ICRC also endeavours to make sure that the civilian population—and others who are not (or are no longer) taking direct part in hostilities—are respected and adequately protected, in particular from the effects of hostilities. These activities are conducted with the purely humanitarian purpose of preserving people’s safety, physical integrity and dignity. Since protecting people affected by armed conflicts and other situations of violence is the ultimate responsibility of States and parties to armed conflict, the ICRC can only contribute to their protection by, inter alia, monitoring respect for applicable norms and standards by the responsible actors. This is in line with one of the roles conferred upon the ICRC: ‘to work for the faithful application of international humanitarian law applicable in armed conflicts and to take cognizance of any complaints based on alleged breaches of that law’. The ICRC’s work in monitoring respect for the law is essentially forward-looking in nature. It aims at improving the treatment of people and minimizing the danger to which they are exposed. This means, in particular, aiming to put a stop to current violations and prevent potential future ones. As such, its focus is rectification rather than retribution.If violations of the law are alleged or observed, ICRC delegates document such information and—where applicable, with the consent of the person making the allegation—bring it to the attention of responsible authorities. The latter are then responsible—if the information is confirmed—for changing relevant practices, including, if necessary, by applying disciplinary or penal sanctions vis-à-vis those responsible. While encouraging authorities’ efforts to investigate and prosecute violations of the law in line with their obligations to do so, the ICRC does not itself participate, contribute to or associate itself with such investigation or prosecution—be it through provision of evidence or in any other way. Such involvement would indeed be contrary to the ICRC’s humanitarian mandate, its fundamental principles of neutrality and independence and its working modalities, including confidentiality. That said, insofar as it helps responsible authorities identify violations of the law by bringing allegations to their attention, the ICRC’s role is complementary, yet distinct, to the interests of justice. The ICRC conducts its activities pursuant to a long-standing confidential approach. This approach enables it to build and maintain a relationship of trust with authorities and parties to armed conflicts. Establishing a relationship of trust is key to entertaining frank and open discussions with relevant interlocutors in order to influence their behaviour. Mutual trust is further necessary for the ICRC’s ability to access persons and areas affected by armed conflicts and other situations of violence, while at the same time ensuring the security of its staff and that of beneficiaries of its activities. Thus, confidentiality is essential to the ICRC’s ability to effectively exercise its mandate, and to do so in full conformity with its fundamental principles. It is not, however, an aim in and of itself—rather, it is a matter of functional necessity, a standard working modality allowing for exceptions in certain very limited circumstances. In the context of detention, the confidential approach is furthermore needed in order to carry out detention visits in accordance with the ICRC’s standard operating procedures. These procedures include the possibility to speak freely and in private with all detainees. Indeed, detainees will only share their needs and concerns if they trust ICRC delegates. This trust includes being assured that the information they share will not be transmitted or published against their will or in a manner putting them or their relatives at risk of reprisals. The same expectation is true for any other person sharing information with the ICRC, be it in the context of detention (e.g., families of detainees, detention facility staff) or in other contexts. 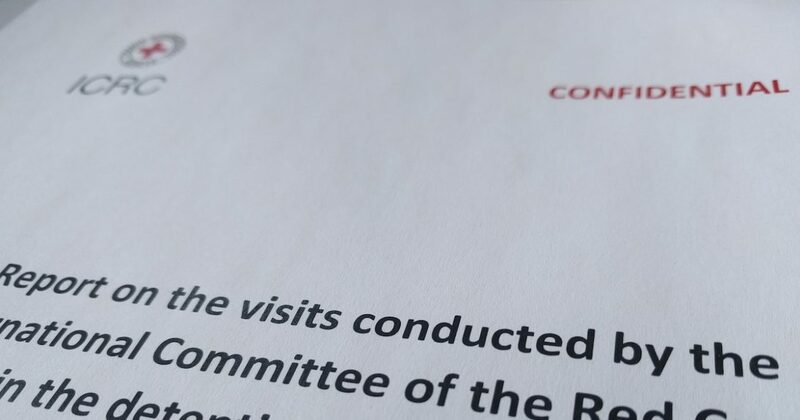 Consequently, when ICRC delegates share allegations they collect or when they communicate their own observations with authorities—whether orally or in a written report—they do so on a strictly bilateral and confidential basis. To underline and formalize the confidential basis of its communications, the ICRC includes upfront confidentiality disclaimers to all of its reports. It also endeavours, where relevant, to conclude framework agreements for its activities. Such agreements contain a standard provision whereby the relevant authority undertakes not to divulge the content of ICRC communications to anyone other than the intended recipient and not to permit the disclosure or use of ICRC confidential information in legal proceedings without the ICRC’s prior written consent. The ‘intended recipient’ includes the relevant authority and its hierarchy. For example, when an ICRC report is handed over to a detaining authority, it is understood that it may be shared within the concerned ministry as well as—as necessary—with other parts of the executive branch that are concerned with implementing the ICRC’s recommendations. It must not, however, be shared with the legislative branch, including parliamentary committees, or the judiciary. Conversely, in some cases the ICRC may choose to address confidential reports on specific issues to judges or parliamentarians. In such a case the same limitation would apply with regard to their sharing outside of the concerned branch. The ICRC’s standard confidentiality disclaimers and the agreements it concludes with authorities further make clear that what is protected is the content of ICRC communications, regardless of the form in which they are embodied. Thus, ICRC confidential information remains protected, for example, when it is reproduced by authorities in their own documents and communications—such as minutes of meetings or internal emails. The term ‘legal proceedings’ is not limited to civil, criminal or administrative process stricto sensu. Proceedings such as public inquiries, coronial and arbitral proceedings, access to/freedom of information proceedings, traditional and transitional justice mechanisms, as well as fact-finding and truth and reconciliation procedures are also included in the term. It is the mere use of ICRC information in such proceedings that must be avoided. This is so regardless of potential mechanisms (such as closed hearings) that limit disclosure to only certain participants or protect information from publication in open judgements. While the authorities may have obligations under domestic law to disclose information in certain cases—such as in the context of judicial proceedings or of freedom of information requests—the ICRC expects them to use all available means to oppose such disclosure. Where such means are not effective or sufficient, appropriate measures should be taken to ensure that ICRC confidential information is exempted from the disclosure obligation, where necessary with the ICRC’s help. ICRC confidential communications—including reports on visits to places of detention and on the protection of the civilian population—are not designed to serve as evidence. The ICRC is not a judicial or investigative body and its role is not to attribute any kind of responsibility itself. Instead, as mentioned earlier, the ICRC raises humanitarian concerns and urges responsible authorities to address these concerns, including by investigating and prosecuting violations of the law. In order to guide the authorities in taking appropriate corrective measures, the ICRC may complement its reports with practical recommendations and, where appropriate, offers of humanitarian assistance (e.g., to help address the needs of affected persons in terms of water, nutrition or health). However, the ICRC never assists authorities in investigation and prosecution. When the ICRC communicates allegations of violations of the law, it expects authorities to conduct their own effective investigations and to verify and establish relevant facts in an independent manner. Only after such investigations and verification can a decision on appropriate corrective measures be taken by the authorities. Indeed, while the ICRC takes its reporting very seriously and does its best to ensure that the information it provides is as accurate and reliable as possible, the allegations it transmits—whether based solely on third party statements or supported by ICRC delegates’ own observations—remain allegations and are not conclusive for the purposes of justice. Furthermore, the ICRC endeavours to make sure that the information it shares is as complete as possible. However, its interventions do not intend to be exhaustive by covering all issues or sharing all information it may have collected. First, the ICRC may choose to focus its interventions on some humanitarian concerns over others and thus tailor its communications to achieve more concrete and realistic results. In this sense, the ICRC’s interventions have to be pragmatic. They have to take into account the environment in which the organization operates, the ongoing dialogue its delegates may have with the authorities, as well as what is feasible in terms of improvement in practices. Second, ICRC delegates may not have seen or heard about a particular issue or may not have obtained the relevant person’s consent to share an allegation. In the context of detention visits, for example, it may happen that, due to authorities’ lack of cooperation, delegates do not get a chance to see all detainees or to inspect all places of detention. Consequently, the fact that an ICRC report does not mention a particular issue—or even contains neutral or positive comments—does not necessarily mean absence of any problems. Moreover, ICRC reports or, more generally, the very fact of the ICRC’s involvement in a particular activity should never be viewed as endorsement or tacit approval of any practices followed by authorities. Thus, for example, if the ICRC carries out visits to certain detention facilities, this is not an indication that these facilities conform to international legal standards. Similarly, the ICRC’s presence and involvement in a particular area or place of concern does not necessarily mean a contrario that there are no concerns elsewhere or that the ICRC is not granted access to such other areas or places. Rather, keeping with its pragmatic approach, the ICRC’s presence or absence in particular places is determined by humanitarian considerations and priorities, in cooperation with authorities. It may also happen that ICRC reports are deliberately used by authorities in a partial or misleading way. This could happen, for example, if they only disclose reports that contain conclusions favourable to them. In such cases, the ICRC reserves the right to publish all the information in its possession in order to give the full picture of its dealings with the authorities. When ICRC confidential information is forcefully disclosed, the consequences of such disclosure or use for the ICRC’s operations, staff and beneficiaries of its activities can be real and very serious. This risk is all the more important in the case of legal proceedings. Indeed, due to their contentious nature, legal proceedings can often be marked with political, religious or ideological controversies. This is especially so in the types of contexts where the ICRC is called to intervene. For example, when a party to an armed conflict exercises its jurisdiction over its current or former adversary, the use of ICRC confidential information is likely to be seen or mispresented as the ICRC’s endorsement of the process—and, therefore, as taking sides in the conflict in question. Even where a particular legal process seems devoid of controversies, the situation may change over time. This could happen, for example, following a change of regime. In terms of operational consequences, the disclosure or use of ICRC confidential information in legal proceedings risks undermining the fragile balanced relationship the ICRC entertains with a particular armed actor—be it locally or in a different part of the world. For example, were ICRC material to be used for the prosecution of a foreign fighter in their home country, this would likely hamper the ICRC’s dialogue with the armed group that person fought for in another country. This, in turn, may cause the ICRC to effectively lose the possibility to influence that armed group’s behaviour. Such a situation could also result in denying the ICRC access to areas and people under the latter’s control, including to those deprived of their liberty. In the worst cases, repercussions may go as far as to put ICRC staff and the beneficiaries of its activities in danger. More generally, and beyond immediate repercussions, disclosure or use of ICRC confidential information in legal proceedings may have serious long-term consequences. It could erode the perception and trust in the ICRC as a neutral and independent humanitarian actor over time. If parties to a conflict were under the impression that information gathered by the ICRC would subsequently be used in legal proceedings, they would be less inclined to cooperate with the ICRC. In addition, the risk of its confidential information being disclosed or used in legal proceedings may have a chilling effect on the ICRC’s own operational decision-making. It could compel the ICRC to refrain from carrying out certain activities in order to avoid that risk. While such consequences may be difficult to measure due to their potential remoteness in both geographical and temporal terms, they may ultimately affect many people. This includes first and foremost persons and populations in need of protection and assistance. These consequences risk increasing their vulnerability and the hardship they suffer. It is therefore justified to presume that the negative implications of disclosure of ICRC confidential information would outweigh the limited immediate benefits there may exist in disclosing it. This should not be understood to mean that the ICRC ignores the interests of justice or the rights to a fair trial of persons involved in a procedure. On the contrary, the ICRC may exceptionally agree to the disclosure of its information in cases where such disclosure would further the course of justice without impeding on the ICRC’s ability to carry out its mandate and without putting its staff and persons benefiting from its activities in danger. However, the exclusive right to decide on such disclosure should remain with the ICRC given that it alone is in a position to fully measure the operational consequences of a potential disclosure. Ultimately—and most importantly—disclosure or use of ICRC confidential information in legal proceedings is contrary to the privilege of non-disclosure the ICRC enjoys under international law. This unique privilege protects ICRC confidential information from being used, and ICRC staff from being compelled to testify, in the context of legal proceedings. The ICRC’s privilege of non-disclosure was first explicitly recognized in a 1999 decision of the International Criminal Tribunal for the former Yugoslavia (ICTY) as a principle derived from the Geneva Conventions and a rule of customary international law. It has since been reaffirmed and adopted by different other international courts and tribunals, including the International Criminal Court (ICC). The privilege is also increasingly recognized at the domestic level through the adoption of status agreements and/or relevant domestic legislation in countries where the ICRC is operating. The ICRC’s privilege of non-disclosure under international law is absolute in nature, which means that it ‘does not admit of, or call for, any balancing of interest’. It is based on the premise that operational consequences of disclosure of ICRC confidential information—which includes safety and security of ICRC staff and beneficiaries—outweigh the immediate interest in disclosing such information. Importantly, however, it leaves the ICRC the ability to further the good administration of justice when it is in a position to do so. For example, in the context of the ICC, where ICRC information is found to be of great importance for a particular case, consultations are held between the Court and the ICRC. Following these consultations, the ICRC may decide whether or not to waive its testimonial immunity in a particular case, taking into account all the relevant circumstances and risks. The ICRC’s privilege of non-disclosure as recognized under international law adequately reflects the primordial importance of maintaining confidentiality for the exercise of the ICRC’s mandate. It allows the ICRC to live up to its commitment of confidentiality vis-à-vis authorities and beneficiaries of its activities and not to lose their trust. Ultimately, only the strict observance of the privilege will fully enable the ICRC to continue fulfilling its mandate in the long run—by gathering relevant information, addressing humanitarian concerns and influencing the behaviour of armed actors in situations to which, oftentimes, no other neutral and independent humanitarian actors have access. In international armed conflicts, these modalities are spelled out in Article 126 of the Third Geneva Convention and Article 143 of the Fourth Geneva Convention. International Criminal Tribunal for Rwanda (ICTR), Special Court for Sierra Leone (SCSL), International Criminal Court (ICC), Special Tribunal for Lebanon (STL), International Residual Mechanism for Criminal Tribunals (MICT), Kosovo Specialist Chambers and Specialist Prosecutor’s Office. For an example of application of the privilege of non-disclosure under domestic law, see Supreme Court of Victoria, Kamasaee v. Commonwealth of Australia & Ors, No.6, Foreign relations & ICRC documents ruling, 7 October 2016. Cf. Rule 73 (4) and (6) of the ICC RoPE. I understand why the ICRC will not reveal the contents of what detainees have said or what it has observed in places of detention. My comment concerns the FACT that person X is in detention. In many cases, in IACs the parties have the obligation to reveal to a protecting power, the ICRC and, through them, the power on which a person depends the fact that an individual has been detained. That fact is not confidential. It would help in at least two ways if the ICRC were willing to confirm that it had seen person X. First, it would help prevent disappearances. Second, where person X is being accused of having committed a domestic or international crime, (s)he may wish to argue that they were in detention at the time. ICRC confirmation would be necessary where the person was held in solitary confinement, resulting in the absence of other independent witnesses. Would the ICRC be willing to confirm that it had seen person X, whilst saying nothing about what the person said, the state (s)he was in or the conditions of detention? Any person whose detention has been registered by the ICRC (e.g. during a detention visit or through notification of detention sent to the ICRC by the authorities) may ask that the ICRC deliver an “attestation of detention” confirming the fact of that person’s detention. Such attestations are typically delivered in the absence of a formal document issued by the detaining authority (such as an official detention certificate). They usually include basic information such as the place of detention, the dates of arrest and release, as well as whether and when the person in question has been visited by the ICRC. As regards transmission of information to third parties on the fact of a person’s detention, it is indeed the rule for the ICRC in IACs to notify a person’s detention through its Central Tracing Agency to that person’s country of origin (or to the Power on which they depend) as well as to their family. However, this rule is subject to an exception in cases where notification might be detrimental to the persons concerned or to their relatives. For civilian internees, this exception is explicitly provided for in Articles 137(2) and 140(2) GC IV. As regards prisoners of war, the ICRC follows the same exception in practice. Thus, when deciding on sharing the fact of a person’s detention, the ICRC is required to give special consideration to the interests of the persons deprived of their liberty and those of their families. More generally, the ICRC endeavours to prevent disappearances by registering the detainees it visits, maintaining family links by all possible means and ensuring that persons deprived of their liberty are able to convey news to their families, including on the fact of their being detained. Furthermore, the Red Cross/Red Crescent Restoring Family Links services are open to all families looking for their missing relatives, including those deprived of their liberty. Any transmission of information by the ICRC in the framework of these activities is likewise informed, above all, by the interests of the detainees and their families. In addition, in any processing of personal data, including their transfer, the ICRC follows its institutional Rules on Personal Data Protection. As regards public communications, the ICRC would in principle not share information on the facts of particular persons’ detention publicly. you are right ICRC is the most Humanitarian Agency help people during war and follow trace of war prisoners .